Food and Wine by Laura L - Pixie & Pirate Destinations *|* Wishes become memories. One dream at a time. In my quest to discover all that is to be offered to the Walt Disney World® Resort guests, I took it upon myself to travel around the World Showcase and bring you as thorough a review as I could. Tough job, I know, but for you all, I made the sacrifice of my waist line. There are several destinations to visit, more than the amount of pavilions in the World Showcase, so small carts are set up around the walkway of WS. It doesn’t matter which way you go, so, I decided to hear to the right and start there. The first kiosk heading “backwards” thru the fest (according to the map) was the Craft Beer booth. I am not a beer drinker. Never have been, but I let my hubby do his choosing. What does he pick? Blue Moon….kinda disappointed me. You can buy Blue Moon in any grocery store, right? So, off we went to Hawaii. The food options at this stop were Kalua Pork Slider w/ Sweet & Sour Dole Pineapple Chutney and Spicy Mayonnaise or Tuna Poke w/ Seaweed Salad and Lotus Root Chips. We opted for the pork and it did not disappoint. Keep in mind, the portions are meant as a sampling and are small. This one was about the size of a White Castle burger. Needless to say, between the hubster & myself, we fought for the bigger piece. (The kiddos were content with popcorn). There were 3 adult beverages at this location, Kona Longboard Island Lager, Kona Pipeline Porter, and Seven Tiki Mai Tai. I opted for the Mai Tai & my husband, the Pipeline (only because they popped the keg on the Longboard & we didn’t want to wait) My Mai Tai was great – almost better than my Chin’s Mai Tai’s at the United Center, but DS didn’t care too much for the Pipeline (he’s not a dark beer drinker). So, off we went to the next stop – “Desserts and Champagne” How can you go wrong there? Here we opted for the sampler – which had all 3 desserts on it: Lemon Chiffon, White Chocolate Macadamia Mousse, and Tres Leches Verrine. All VERY tasty! While my goal was to try something at each kiosk, I quickly determined that this would be challenging. Yes, I was able to use snack credits from the Dining Plan for nearly everything except alcohol, even these small portions were filling! As a result, we did not try anything from Greece or Canada – the next two kiosks. Our next stop was Ireland. Here there were some interesting offerings: Lobster & Scallop Fisherman’s Pie, Kerrygold Cheese Selection, and Warm Chocolate Lava Cake with Baileys Ganache. Being a baileys lover, I chose the lava cake. While many seemed to think it was far too small in size (about the size of a half dollar) let me tell you, much larger and I don’t think I would have been able to eat it all as it was very rich. But totally delish! We made our way to France where I had to try the Parisian Cosmo Slush. It was good, but a bit to sour for my taste. It was also one of the most expensive drinks I tried (around $9). From here we moved on to Belgium where we sampled a Belgian Waffle w/ Berry Compote and Whipped Cream. This one was enjoyed by the entire family! Moving on we skipped the Portugal Wine Bar, Portugal, and Morocco. I meant to get back to Morocco, but never did. The next pot of call was New Zealand, and let me tell you, I have never had a bigger or better scallop as I did there! It goes without saying; we chose to try the Seared Sea Scallop with Kumara-Red Curry Puree and Apple radish Salad. I really hope this makes a return to the fest! It was by far one of my favorites! Again, we skipped a few stops – Japan, Singapore, Hop’s & Barley, Fife & Drum, and Italy, but then decided to stop in Poland. I am of Polish decent, so I really enjoy a good Pierogie – and I am NOT talking about a frozen Mrs. T’s *blech* I mean an authentic handmade pierogie like my grandmother & her friends made at the church all the time. So, I jumped in line & hoped for the best, ordering the Kielbasa and Potato Pierogie with Caramelized Onion and Sour Cream. *side note: I had been wearing my birthday button on my lanyard all week and the CM took note of it and thought it would be cute to try to turn my pierogie into a birthday cake of sorts by writing ‘happy b-day’ on it…didn’t fit well, but was a cute thought! Anyway, I am happy to say, they did not disappoint. Both the kielbasa and pierogie were quite yummy! We skipped the Germany kiosk because the kids got a pretzel & some caramel yummies from the Werther’s store & I made my annual stop in the wine cellar to pick up a couple bottles of my Diva Riesling that I cannot find anywhere else but there! But again, moving on from there, with my wrapped & boxed, safe for airline travel, bottles of wine in hand, we passed several more kiosks (Brewer’s Collection, Cheese, South Africa, South Korea, China, and Scandinavia) before stopping in Mexico. Here we tried Grilled Ribeye Taco with Chipotle Pepper Sauce and Scallions on a flour tortilla and the Crispy Shrimp Taco with Chipotle Lime Mayo and Cabbage on a flour tortilla. Adding to the fun, I had a Strawberry Lime Margarita and my husband the Dos Equis Beer (again…why? You can get this anywhere – lol) All were very good, but this was the first treat we had to actually stop to eat. It was difficult to enjoy these while walking. I never thought a shrimp taco would be so yummy! The next stop was the Caribbean. Now even though I was beginning to feel a bit tipsy after the huge margarita, I had to try the drink that I had heard so much about…the Frozen Rock Coconut Mojito. Wowzers! I really liked that one! Hope they bring that one back again, too. But, if they do, they should make the portion a bit larger. It seemed much smaller than all the other cocktail offerings. Or, better yet, offer sizes. But that’s just my opinion. Wrapping up our tour of flavors was Argentina, Brazil, (both of which we skipped by) and ending in Australia. We just couldn’t pass on Shrimp on the Barbie (served with pepper berry citrus glaze) and it did not disappoint! As I said, we were able to use snack credits for most of our sampling. Food pricing averaged between $3 - $5 and adult beverages between $4 and $9. They offer a cute little reloadable gift card that is attached to a stretchy wristband that you can wear so you aren’t reaching for cash each stop. I would have probably gotten one if I hadn’t been using dining credits. It just makes things easier to hand off the card. For a first timer at the Fest, I found it to be enjoyable. While I hear the rumors of drunks walking around and causing problems, we only encountered 1 or 2 who seemed to have been over served. Instead of letting it ruin our fun, I chose to use it as a teaching experience for the kids. “Look guys, that is how stupid you will look if you drink too much”. Not sure if it helped, but they didn’t seem bothered by what they saw. I can say if you do the Fest on a weekend, get there earlier in the day. We started at about 11 on a Friday and moved on about 4 or 5 when it really picked up. The day we stayed for the Eat to the Beat concert, the show started at 5:15 and walking thru to the exit to Boardwalk was challenging, especially with a stroller. But other than that, I had no real complaints. I haven’t filled my hubby in yet, but I definitely plan a return trip for this event. If he doesn’t want to go, I am sure I can find a girlfriend or two to join me! 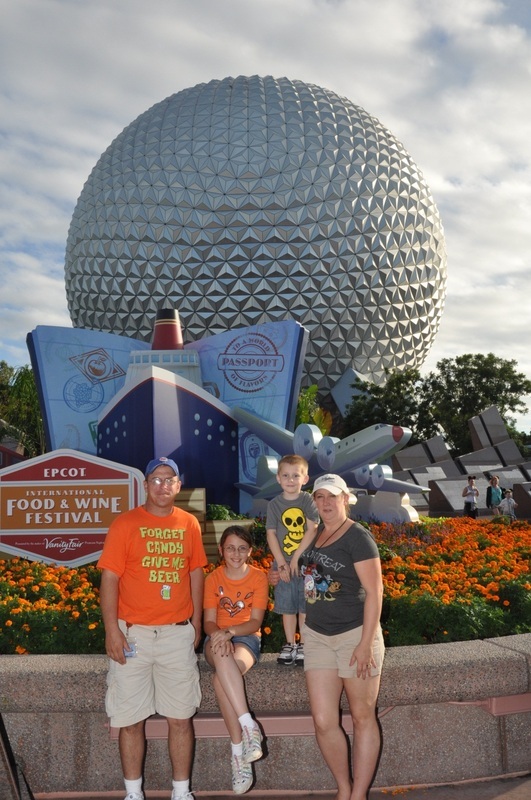 Experience EPCOT's Food and Wine Festival - Request a Disney vacation quote today!